Making herbal elixirs is a practice you can add to your longevity lifestyle. What are herbal elixirs you ask? 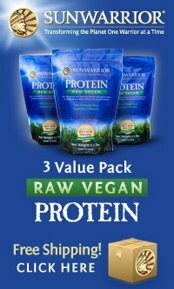 A growing trend in the live raw food/superfoods community is the creation of a daily meal that combines the best quality adaptogenic herbs and live superfoods in high quality water. The way that this daily drink differs from the typical healthy smoothies you see (or might make) is that herbal elixirs are crafted with a bit more care and much more intention. 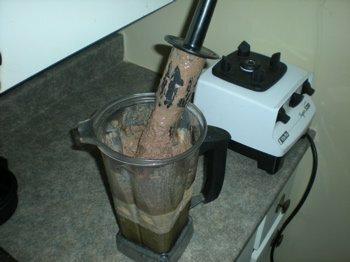 Most smoothie recipes read a bit like this: "throw X,Y and Z into a blender and pulverize it"! The herbal elixirs that are being created by many people in the raw living food and longevity lifestyle community are often composed of multiple steps and will often have an intention or strategy behind them (such as building the body's immune system up, or building stronger bones, etc). These drinks do not take a long time to make, and although they are generally more complicated than making a slurry-like-smoothie, once you learn the steps and idea behind making them, they become an art form that is both enjoyable and health building. 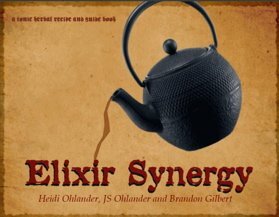 The beautiful and thoughtfully made ebook "Elixir Synergy" by Heidi Ohlander, J.S. Ohlander and Brandon Gilbert is a basic guide to help you get started on this fun and exciting path. A mysterious tonic that was pursued by many alchemists and mystics of the past was "the elixir of immortality"
Also referred to as the elixir of life, the motivation behind its pursuit was that whoever was able to create or discover it gained supernatural abilities, possibly even becoming immortal! Legends of this substance being sought after can be found in many ancient cultures around the world. Often herbalism is tied in with the philosophy of how the elixir of immortality was thought to have been formed. It can't be said for certain whether there is one specific elixir of longevity recipe that is an all encompassing panacea (cure-all), but what does exist is a continually evolving and improving understanding of adaptogenic herbs, whole food nutrition and live superfoods. 21st century herbalism is all about using modern tools and knowledge and combining it with the ancient secrets of the tonic herbal and superfood traditions from around the world. The optimal way to add in these adaptogenic herb's longevity enhancing effects is to make one meal of your day an exquisite tasting drink. It's best to think of this as a daily "practice", much like brushing your teeth, bathing or exercising your body in some way. You can learn about the basics of how to craft these simple herbal elixirs with the downloadable ebook "Elixir Synergy" which is composed of over 130 pages of instruction and over 30 amazing recipes! The number one most important tool used in modern herbalism for creating herbal elixirs is definitely a high speed blender manufactured by Vitamix or Blendtec (available by clicking this link). These are the two leading companies and each have their pros and cons. The Vitamix has the ability to make herbal ice creams (since it has a tamper that fits in through the lid) and has a manual speed control knob (great for slow grinding seeds into flour and making ice cream). While the Blendtec is unable to easily make "ice cream herbal elixirs", it does have a more powerful motor and a larger and better carafe (blender container) design for efficient pouring and cleaning. Purchasing a high speed blender is essential for liquifying nuts and seeds, breaking up coarser herbs and superfoods and essentially achieving that smooth and palatable consistency you want for the art of crafting your elixir of life! ~Pour 1 liter of very hot spring water (steaming, but ideally not yet boiling) over 1tbsp each of dried gynostemma, ginkgo biloba and epimedium in a glass or ceramic pot. Let the tea steep covered for approximately 15 minutes. ~Strain the tea into the blender container and add 2tbsp of hemp seed, 2tbsp of chia seed, 2tbsp of cacao nibs, 1tbsp of cold-pressed coconut oil, 1tbsp of bee pollen and flavor with orange peel zest or a few drops of red mandarin essential oil (whatever's on hand!). Blend on the highest setting to break up these coarse ingredients. ~You can add all of your powdered live superfoods to your elixir of life at this point. Add 1tbsp of mesquite powder, 2tbsp of maca powder and 3tbsp of cacao powder. Raw cacao powder and cacao nibs have a wonderful effect in making bitter tasting herbs palatable and also increase their absorption rate in your digestive system. Click here to learn about the benefits of raw chocolate! 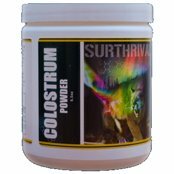 ~To finish off add 1 teaspoon each of the extracts of he shou wu, reishi, cordyceps and astragalus from Hyperion Herbs (click this link to find these high quality herbal extracts). Also feel free to sweeten your herbal elixirs with any combination of stevia, raw honey, yacon root syrup, xylitol and/or coconut sweetener. ~Do your final blend on a slower speed since these ingredients are more delicate and already in a powdered form. Taste your drink before pouring and make any adjustments with the sweetener/spices that you need, then serve and enjoy! As you can see, consuming herbal elixirs in this way is easy, fun and an absolutely delicious way to take in the amazing properties of tonic herbs and superfoods that many people have trouble working with. 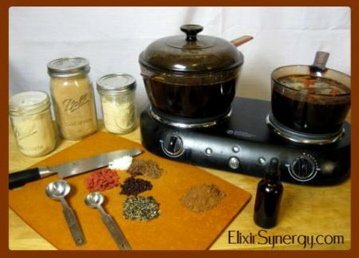 Herbal elixirs truly bring your medicine cabinet into your kitchen and make being healthy an art form that is truly enjoyable and not self torturous! Click to return from "Herbal Elixirs" to the "Diet For Longevity" page.